« Will you wait for me? I received the best Christmas gift ever in 2009: a Broadfork. This tool, originally from Europe but redesigned for Yankees with Yankee ingenuity by the always-worthy Eliot Coleman, is impressive. 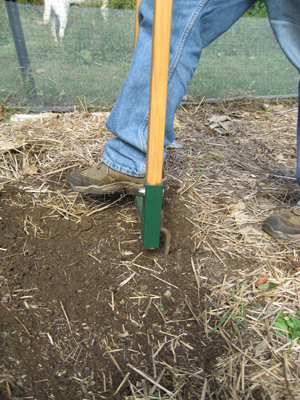 Its function is to gently lift and aerate the soil. 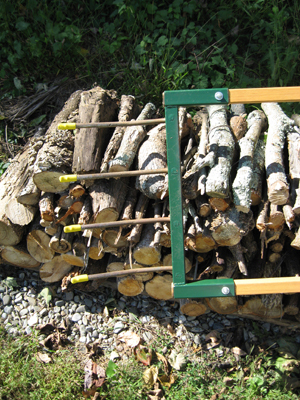 Its handles are made of American hardwood. The tines are weighty, angled, and very sharp. The tool arrives with yellow rubber tips protecting your hands from the razor-sharp edges and the sharp edges of the tines from anything less worthy than soil. I think it is beautiful. Placed to show off those pretty yellow covers. A new theory of soil, and how to improve it, is basically to STOP trying to improve it. There was a certain righteousness in turning over the garden soil every spring — the longer and harder the work, the better person you were. 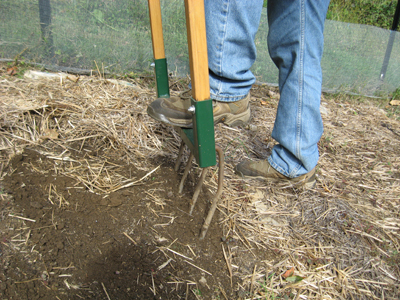 You were mixing in nutrients, putting air into the soil, preparing a bed for your babies. The new thought is that Mother Nature is more competent than we give her credit for. The world existed long before gardeners, and did just fine. The worms and bacteria, actually, were doing just fine. The new thinking is that when we spade down deeply, lift and turn, we are bringing weed seeds up to the surface and destroying the tunnels and activity of the worms. Place the tines on the surface of that lovely dark dirt. Place your foot, and balance yourself. Step down, pressing the tines in deeply. Put your weight on it, until the tines are buried. 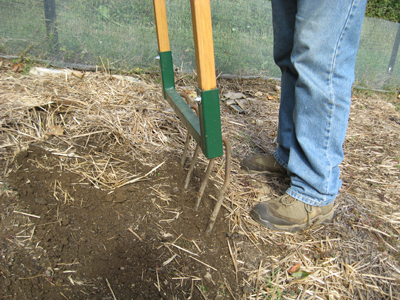 Pull back on the handles, rocking the tool in the soil. 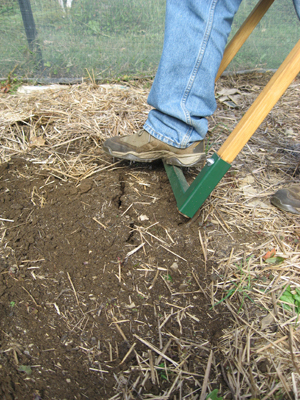 Can you see that break in the soil just in front of the tool? That's the tines, doing their work. 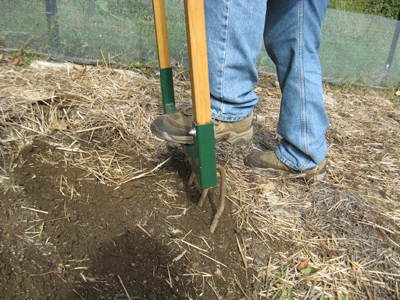 I love this tool — its simple elegance, its ease of use, its attractiveness, and most of all, its role in making my garden a better place for worms. That’s my kind of righteousness.